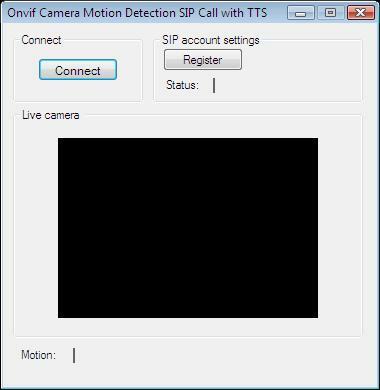 In this guide you can find information on how to connect an IP camera to motion detector with your Windows Forms/WPF Application written in C# and register your program to a PBX and make a VoIP phone call to an alarm monitoring center with text to speech. To implement this example, you must have OZEKI Camera SDK installed, and a reference to OzekiSDK.dll should be added to your Visual Studio project. To make the SIP functions working you must have a PBX and you will have to modify the programs connection data to the proper IP-adress. How to handle alarms, by making a VoIP phone call to an alarm monitoring center with text to speech using C#? To establish the connection properly between your application and an IP camera you should apply the same code snippet what you have used in the example (How to connect to an IP camera device using C#?). Important: you should study this article in order to find out how to setup your Windows Forms/WPF Application correctly. It's also recommended to visit the How to setup viewer side motion detection article before you begin to study this function. private TextToSpeech _textToSpeech: The C# written TextToSpeech class is available with the OZEKI Camera SDK. With the help of the TextToSpeech class you can create instances which are able to convert text - which is given as a parameter (or the path of it is given as a parameter) - to voice data. This instance can be attached to the call through the correct sender object, so the stream of voice data can be sent to the destination as in the case of the usage of a microphone. To make your example working you have to modify the parameters of the Register function in this method. Set the last parameter to your PBX IP address and if necessary, modify the other parameters to fit your PBX settings. we also initialize this softphone with default parameters. Please note that none of the cancel and disconnect methods are included in the example because of the demonstrating intent and briefness of the article. After the successful implementation of the functions and the GUI elements, the application will work properly. Pressing the connect button will load in the image of the IP camera device connected to your PC into the panel that you can see on the picture. When the motion detector detects motion, motion label text will be true. If SIP account register is succeeded than the program call to an alarm monitoring center. Below you can find the code that belongs to the interface of the previously presented application. With the help of this section your Windows Forms Application will be able to work properly. Below you can find the code that belongs to the interface of the previously presented application. With the help of this section your WPF Application will be able to work properly. DISCLAIMER: Please note that the following features will only work if your IP camera supports the given function. You should check the user manual of your IP camera to make sure it supports the feature that you wish to implement in C#. You should add the OzekiSDK.dll and the System.Drawing.dll to the references of the solution. My phone does not ring, when the camera detects a motion. Why? Make sure your PBX is configured right. Make sure the dialed number whether is valid. Make sure your registration datas is valid.